My, my, my. We have never met a more well-behaved, protective, and orderly little kid! Does this sound familiar? Is this the feedback you tend to get about your little one’s behavior from teachers, babysitters, and other parents at school? 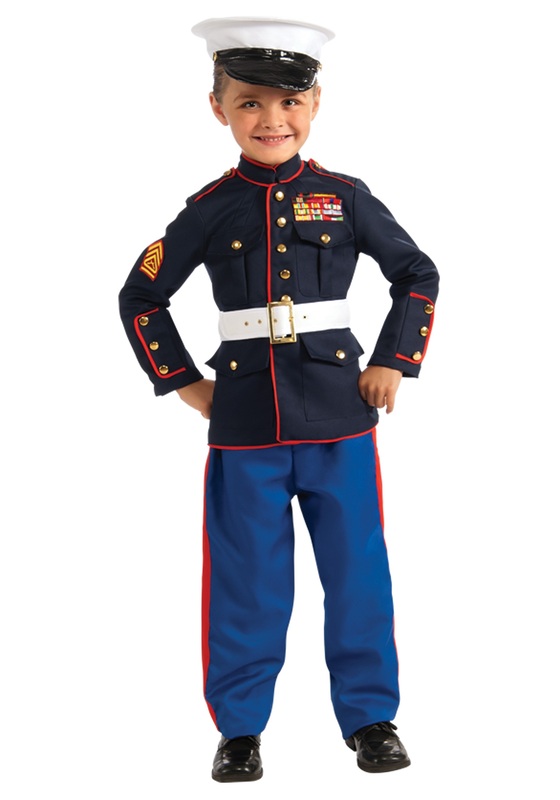 Well, before we drag you aside and grill you about how, for goodness sake, you managed this feat of parenting, might we suggest a costume for your little cadet? In this Child Marine Uniform Costume, your little go-getter can become a true force to be reckoned with! No, we’re not advocating fighting--the might of the Marines is only one aspect of the longstanding military branch. But your kid loves high security, a well-made bed, an early wake-up time, and an amphibious lifestyle (you know how it goes when it’s time to get out of the bath!) so we think this uniform may really hit the mark. We hear that a slick uniform and cool hat is half the battle, which is why the Marines know how to do it right. This decorated navy blue jacket has red trim and accompanies sky blue pants with matching red stripes on the sides. The signature white hat matches the belt and ties the whole look together. He may not quite be ready for THE basic training, but it seems his basic training in life turned out A-OK. And honestly, what parent can resist seeing their little one in uniform?